These are just a few of the many dogs and puppies Homeward Hounds has available for adoption. Over 20 dogs are still waiting to leave the original kennel. We're working on getting their pictures added so please bear with us! You can see these doggies at our adoption days every Saturday from 12 pm `til 4:00 pm at Petco on Hawthorne Boulevard near 190th street in the Torrance Promenade shopping center (next to the Sears Homelife store). If you have any questions about a particular dog, please feel free to e-mail us. For further information on our adoption process, please refer to our Adoption Policies page. Volunteer Erica wrestles with her good buddy Gonzo at a Homeward Hounds adoption day! We are in desperate need of foster homes, as most of these dogs are still living in poor conditions due to our lack of space and funds to move them from their original kennel environment. If you're interested in fostering, please refer to our Foster Parenting page or if you'd like to make a donation, please refer to our Donations page. You can also help by Sponsoring a Dog. This page is usually updated every Saturday, so be sure to check back! The second picture was a little dark so I lightened it. Unfortunately, these pictures are of Gonzo when I first started working with him, so they don't show the huge smile he always has on his face. We'll get a more recent picture up soon! Click on the top picture of Gonzo to read his story and his weekly recovery log! 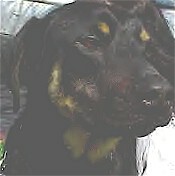 Gonzo: 3 year old male Shepherd/Rottweiller Mix. I found a foster home! I really can't say enough about how sweet and loving this little boy is. He absolutely LOVES sitting in your lap when you let him & he has no trouble showing you how much he loves you by gently putting his head in your lap & nuzzling you. I honestly can't put into words how gentle and affectionate he is and how he shows you in his own sweet way that he's grateful for any kindness shown him. Gonzo is definitely a low-maintenance kid with one of the silliest personalities I've ever met! He'd be one we'd describe as a goofball! Not only is he calm inside the house (although very playful when you throw his toy for him outside! ), he's perfect on walks & is a dream in the car. He is one of the most well-behaved kids I've ever met and he's easily won the hearts of everyone at the rescue. He will be very hard to part with. Gonzo was sometimes afraid of boisterous children when we first started working with him since he'd never had experience with them, but he's no longer afraid & is great with everyone. He'd be great for older children. Click on the picture to see what Luna looked like when she was first picked up. Luna: 1 1/2 year old female Boxer/Pit Bull Mix. I desperately need a foster home! This little girl is going to be extremely hard to part with. Luna has the sweetest spirit and has nothing but love to give. She is the most loyal kid I've ever seen and bonds very strongly with those she loves. She has the silliest personality! I call her the goofball of our rescue because she definitely has the carefree, silly personality of a child. When she was picked up off of the street she was so emaciated & malnourished that we didn't think she'd make it, but her strong spirit and love of life helped her to pull through without a hitch! To see what she looked like when she was picked up, click on her picture to the left. Luna is extremely playful and loves to wrestle with other doggies! She's had a great time when I've taken her to the dog park! l walk her on a retractable leash & am teaching her to stop and sit at every curb and to stay put when a car comes by. She's doing unbelievably well! She's got lots of playful energy & is very strong, so at adoptions people who ask to walk her are sometimes overwhelmed when she starts pulling while walking and then are surprised that she becomes very well-behaved when I take her leash (I'm 5'5" and am smaller-statured). This is because she knows that I won't let her get away with pulling, etc., so she just needs someone who will be consistent but loving with training. More than any other kid I've worked with, Luna really wants to please you, so she responds very well to training. 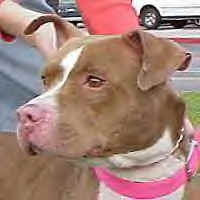 Luna DESPERATELY needs a foster home. 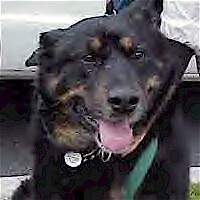 Oso: 5 year old male Rottweiller/Shepeherd mix. I'm still living in the kennel so I desperately need a foster home! This boy is a large (approx. 70 lbs.!) bundle of love & smooches! Oso loves everyone, including other doggies & kitties and he adores kids! He's an incredibly sweet, gentle boy. He's a mellow kid & would really be perfect for a family since he's very low-maintenance. He doesn't pull on walks and is very playful! 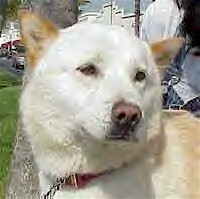 This beautiful boy was rescued from South Central where he had been dumped and was wandering the streets for over a month. Oso means "bear" - he got his name because he's a big teddy bear! Picture coming soon! Brandy: 1 year old female light tan (with a very light undercoat of brindle!) Terrier mix. This little girl is very petite and at her full weight is no more than about 35 pounds. Her eye has a congenital defect that prevented it from forming fully, which makes her shy at first, but once she gets to know you she's truly the most loving little angel you could imagine. She loves nothing more than to have her head in your hands while you kiss her nose & face. She'll sit there like that with you for hours if you let her! Brandy is very mellow inside but loves to play with other dogs. Don't think for a minute that her eye incapacitates her! She had a great time wrestling with the 70 pound male dog she's lived with for the last 2 months - her eye definitely doesn't stand in the way of her playtime! She would do well with another dog, (she really became attached to the male Pit Bull she lived with & they sleep together, ate together & cuddled together on the couch! ), although she would absolutely love to be an only kid. I'm still in the kennel so I desperately need a foster home! Bear is a real sweetie! He's got such an adorable face & a personality to match! Every one of our volunteers has just fallen in love with this kid! He loves to be cuddled & can't get enough scratches behind the ears! Bear should be in a home with someone who is familiar with his breed. 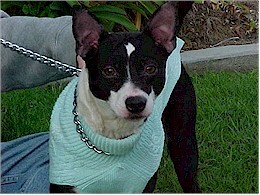 Penny's little sweater keeps her warm at a Homeward Hounds adoption day! Penny: 2 year old female Terrier Mix. What a doll! This little girl is an angel! She's very happy & isn't a barker but doesn't like other dogs so should be the only furry member of your household. Penny isn't too high-energy, she loves walks and can't get enough kisses! Click on Daphne's picture to read the most recent update of her personality & behavior! Daphne: 1 1/2 year old Terrier/Dalmation mix female. All white, absolutely adorable little sweety! Daphne only has spotson the backs of her ears and on her undercoat. You won't find a more loving, sweet furry kid than Daphne! She loves to play & takes walks but is just as happy sitting in your lap! She currently lives in a foster home without a yard & her foster parents say she's great inside the house, isn't high-energy & she was housebroken within the first 2 days! As you can tell she's extremely intelligent! Chloe: 3 year old Anatolian Sheepdog mix. Chloe is such a sweet girl but, like most of her breed, is a little shy with strangers at first. This breed is very loyal and loves affection. This little girl needs a lot of TLC and will definitely return the love in spades! Max is such a gorgeous, sweet-natured little boy! He is one of the kids I spend a great deal of time with and it's going to be very hard to see him go. Max has the initial Husky-aloofness, but once he knows you he is an incredibly sweet , loyal little boy who absolutely loves getting affection & attention. When he knows you he will happily show you that goofy little personality of his! He LOVES to play chase & has a great time with his squeaky toys! Max is very quiet - he very rarely barks! Max gets along great with everyone (including kids!) except other dogs and cats (hey, we can't all be animal lovers! 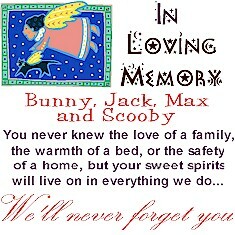 ), so he'd like to be the only furry kid in your household. He's only about 40 pounds. Max-y is excellent in the car - he loves car rides!! When I take him with me during the day he lays down the entire time and when I leave the car he patiently waits for me to return without so much as a complaint. Max would be great in a townhouse since he's not high-energy & doesn't bark! 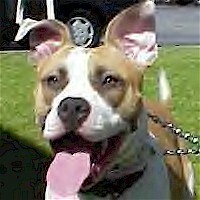 Rosie: 2 year old female brown/white Staffordshire Terrier. What can you say about an angel? Everyone who meets Rosie is absolutely astounded by how friendly, gentle and calm she is. She's been staying in a foster home with 2 little girls aged 3 & 7 & they adore her! The foster mom has fallen in love with her & said she couldn't believe how wonderful she is with the little girls. Unfortunately in that foster home the dogs are only allowed to sleep outside & Rosie climbed the short fence, so we had to put her back in a kennel. If you're looking to foster a very calm kid who doesn't bark (I've known her for close to a year and I've literally never heard her bark), Rosie's your girl! Rosie is full-grown and is only about 35 pounds. She's very petite and low to the ground! 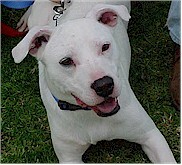 She has an incredibly sweet temperment, is great with adults and children alike & is excellent with commands! She is playful & happy and wants nothing more than to please! She is wonderful inside the house since she's housebroken, never barks & has a very calm temperment. Literally everyone who meets her falls in love with her! Rosie isn't a barker & isn't destructive at all! She's such a well-behaved little girl! Rosie is somewhat socialized with other dogs, but needs to be in a home as an only dog (also no cats). Did I mention that she snorts like a little pig when she's happy? Everyone who meets her thinks it's the most adorable thing they've ever heard! Picture coming soon! Ellie & Gracey: Ellie is a 4-5 year old female Husky and Gracey is an 7-8 year old Shepherd/Chow mix. We desperately need a foster home! These 2 little girls were found running down the street together. Their owner never claimed them, so we've taken them in. They didn't want to leave each other & refused to be separated, even when we were trying to get one in the car before the other, so we'd like to place them together. The girls are now in a foster home with 2 little girls (4 & 7) & are doing wonderfully. They get along with everyone including other doggies & kitties & would love to find a happy home together. They're both very mellow, never bark & aren't destructive at all. The foster mom says they're perfect little ladies! We'll have pictures of all of the doggies up soon! 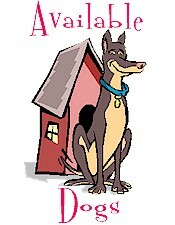 We have over 20 dogs available in addition to the ones listed so far, so if you're looking for a particular type of dog please let us know, we may have just who you're looking for!